The Medaryville / White Post Twp. 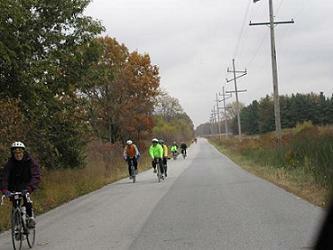 Fire Department invites you to the 21st Annual “Crane Cruise” bike ride. Medaryville is located on US Highway 421 in Northwest Indiana. The ride will take place along paved back roads of rural Pulaski and Jasper counties, past fields of feeding Sandhill Cranes. The ride will begin and conclude at the Medaryville Fire station. Ride lengths will vary from 14 miles to 50 miles. Lunch will be served at the Medaryville Fire station for all riders. Our rides feature well stocked SAG stops with various fruits and homemade snacks. Please join us at dusk for an informative talk at the Jasper-Pulaski Fish and Wild-life Area’s crane viewing tower. 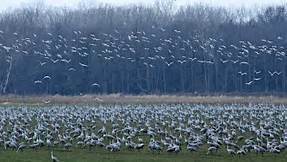 Following the program will be the star attraction: the return of thousands of noisy sandhill cranes that are returning from their feeding activities to their nightly resting grounds at the Jasper-Pulaski Fish and Wildlife Refuge. Be sure to bring your binoculars for this truly awe inspiring spectacle.